The narrow blade has sharp edges, making is very easy to use. 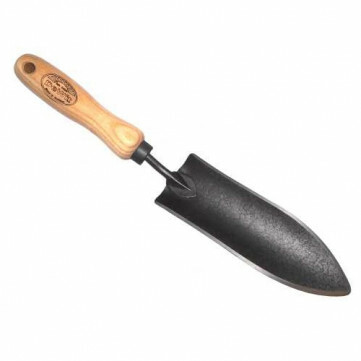 This is a great tool for planting bulbs, extracting tap-rooted weeds or planting seedlings in small spaces because of the narrow blade, less than 2.5" wide. Strongly constructed using tempered steel, it wont bend with normal use. The blade measures almost 7" long, and is less than 2.5" wide, and the contoured handle is 5" long. The Dutch are highly regarded as makers of the finest gardening tools, and De Wit has been leading the way since 1898. The business is now run by the 4th generation of the De Wit family, using traditional techniques. All handles are hardwood, made from Oiled Ash which resists shock better than oak or beech. Blades are made from Carbon Steel, which is naturally tougher than stainless steel, and then burnished to protect it for longer and give it an authentic blackened patina similar to tools from the Edwardian era.